We’d love your help. Let us know what’s wrong with this preview of Onwaachige the Dreamer by Jay Jordan Hawke. Fourteen-year-old Joshua Ishkoday faces an impossible decision as a terrifying dream sets him upon a thrilling and treacherous journey of self-exploration through the dangerous vastness of the Wisconsin northwoods. There, along with his best friends, Mokwa and Little Deer, Joshua su What would you do for the boy you loved? What if to save him you had to abandon him forever? To ask other readers questions about Onwaachige the Dreamer, please sign up. In the process of becoming you learn what is important and what is not, and what you are willing to risk for what you want. This is a coming of age story featuring a young man with one Ojibwe parent and one Fundamentalist Christian. Joshua has been learning about his Native American heritage recently and finding it a better fit for him than his mother's less tolerant beliefs. Here,the friendship of Mokwa, Little Deer, and Joshua intensifies as they help him escape his mother. Joshua’s dreams didn In the process of becoming you learn what is important and what is not, and what you are willing to risk for what you want. This is a coming of age story featuring a young man with one Ojibwe parent and one Fundamentalist Christian. Joshua has been learning about his Native American heritage recently and finding it a better fit for him than his mother's less tolerant beliefs. Here,the friendship of Mokwa, Little Deer, and Joshua intensifies as they help him escape his mother. Joshua’s dreams didn’t end with the tragic events at Scout camp, in fact, they intensify. The Christian doctrine has been increasing with each book in the series, and here Hawke highlights the hypocrisy of devout Fundamentalist Christian behaviors with the scripture. In contrast, there is a new character brought in to elucidate that Fundamentalists don’t speak for all Christians by providing an alternative representation of the faith. I appreciated the different view, for rarely do radical elements in a religion speak for all those practicing it. This book sees Joshua/Pukawiss/Onwaachige/Red Feather embrace his Native American half as he explores and accepts Ojibwe beliefs and practices. His growth and responsibility of his burgeoning powers as a Dreamer sets him free and brings back that which he thought was lost. The writing itself was stilted in areas for me. The first chapters' exposition was repetitive and lacking lyricism as it was relayed in a reportage summary. Additionally, the omniscient voice was overly intrusive at times. While the pace was good, the style of the writing itself hit rough patches. None of this is to say that I didn’t enjoy it, I was committed to Joshua’s story and wanted to see it to the very end. Favorite character throughout the series, Little Deer. Though Gentle Eagle is a very close second. There are some wonderful characterizations in the series and this book added to them with two in particular, Caleb and Pywacky. Overall, a story of friendship’s power. 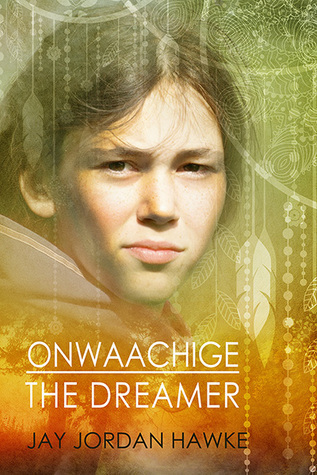 Onwaachige The Dreamer, the third book in the Two-Spirit Chronicles is another delightful read by Jay Jordan Hawke. I loved the first two books in this series and the third is no exception. Not as dark as the second book, this one reaches levels of genuine hilarity in the banter between fourteen-year-old Joshua and his best friends, Mokwa and Little Deer. These three teen boys have distinctive personalities and play off each other perfectly. Having only just met at the beginning of summer in the Onwaachige The Dreamer, the third book in the Two-Spirit Chronicles is another delightful read by Jay Jordan Hawke. I loved the first two books in this series and the third is no exception. Not as dark as the second book, this one reaches levels of genuine hilarity in the banter between fourteen-year-old Joshua and his best friends, Mokwa and Little Deer. These three teen boys have distinctive personalities and play off each other perfectly. Having only just met at the beginning of summer in the first book, they bonded as only friends who were meant to be friends can bond. These three boys could be a comedy team. They know each other’s rhythms so well and their dialogue, as they first try to keep Joshua’s presence a secret and later set off into the north woods in search of Joshua’s father, is always spot-on and sometimes laugh-out-loud funny. If this story were set in the present day, these three would be You Tube sensations – all they’d have to do is get on camera and just be themselves. I also love the character of Gentle Eagle, Joshua’s wise and patient grandfather. In this installment, he has some extremely well written scenes with Pastor Martin, a minister who has lived on the reservation for decades. Previously, Martin came across as a self-righteous man who disdained the Native culture that surrounded him and believed he had all the answers. In his extended conversations with Gentle Eagle while they search for the missing Joshua, the man comes to understand and accept that Native ways are not bad and don’t conflict with his Christian beliefs as he’d always thought. Because he’d never taken the time to understand Gentle Eagle and the Ojibwe culture, he’d never realized how narrow-minded he’d become. These two men form a much stronger bond in this book, one that is built on mutual respect. Nice to see. Absolute loved this series! These books need to be in every school library for everyone to read. Truly that enjoyable. This is book three of a series. I think you can probably understand them ok alone, but you would get a better impact reading in order. Joshua has just come home from his summer camp ordeal reeling over the death of a fellow campmate that bullied him and a few others. He falls asleep and dreams about Cody seeing his fate and knows the only way to save him is to leave him forever. He runs away back to the reservation where many things come to light. This is such a beautiful story. I have enjoyed Jos This is book three of a series. I think you can probably understand them ok alone, but you would get a better impact reading in order. This is such a beautiful story. I have enjoyed Joshua’s story from the beginning, and it just gets better and better. The storyline flows so smoothly; the characters are fun and lively, there are folklore, Indian stories and such a great comradery between Joshua and his friends. We also meet some new friends both animal and human. I liked the way Christianity was handled in this story along with other religion. I think the battles between Gentle Eagle and Pastor Martin added a lot to the story as well as Caleb debunking all of Joshua’s beliefs that all Christian’s are bad.Speaking of Caleb, I hope we get to see more of him in future books, and I hope there are more adventures of Pukawiss to come! If you like Indian stories, Indian legends, courageous teens, YA fiction all-over fabulous read you must read this! I love this series. I especially like the way the main character, Joshua, continues to grow and control the direction of his life. And, of course, I really enjoy the depiction of Native American lore and customs. Still want more. But excellent third in the series. I hope this won't be the last that we read about these wonderful characters. Book 1: Pukawiss the Outcast, a Lambda Literary Award finalist for Best Young Adult Gay fiction. Book 2: A Scout is Brave, a 2015 Rainbow Award winner for Best Young Adult Gay Fiction. Book 3: Onwaachige the Dreamer.